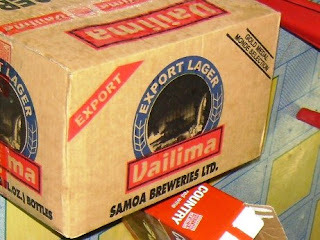 Vailima is the national beer of Samoa. It is brewed just outside of Apia in the village of Vaitele, and it is just about the only beer served by most restaurants in the country. It takes a bit of time to adjust to the concept of having only one beer. When my parents were here, my dad would ask what beers a restaurant had. “Vailima,” the waitress would reply. “What else?” My dad would ask. “Vailima,” the waitress would patiently repeat. Despite the lack of options in beer, Vailima provides its own variety. From what I can tell, Apia Breweries is still working on a good system to better monitor taste consistency. Vailima can be a difficult beer to pin down. In the Gumpian box of chocolates sense, you never know what you’re going to get. It can be fruity and smooth at times, at other times bitter and hoppy. 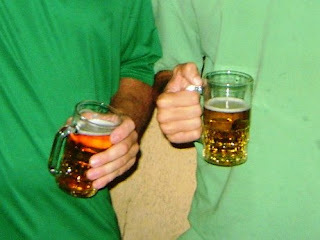 Taste can also be affected by two other factors: color of bottle and circumstances of delivery. The 750-ml variety comes in brown bottles and green bottles, although there is no difference in the label. There is constant debate among Peace Corps as to what effect, if any, this has on the beer (In a previous post’s comments, Victor’s brother PJ entered this debate). In my opinion, the bottle color’s effect is negligible compared to the many other variables that determine the taste of most bottles. More of a factor are the circumstances of delivery. 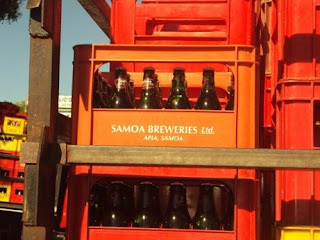 Vailima is often shipped on trucks that don’t offer the beer protection from the sun (let alone refrigeration), so the taste of the beer can be greatly affected by such factors as the time of day it was shipped, how long it was on the truck before delivery, and where on the truck that bottle sat (closer to the gate means it gets unloaded more quickly, closer to the cab can doom a bottle to skunkiness). Paul once took the smaller (unshaded) ferry to Savaii and watched helplessly as a Vailima truck roasted in the sun. It makes a difference. This variation has driven some Peace Corps to opt for the Vailima on draft wherever possible, which is vastly more consistent and often slightly cheaper. I prefer the ergonomics of the bottle; that and the challenge and thrill of the unknown. Though Vailima has an export variety, which I’ve heard is far superior to the watered-down variety available in-country, it’s a fairly small label, and can be nearly impossible to find. I tried looking in specialty stores with no luck. I’ve heard that American Samoa may be the only place to find it easily. As Peace Corps lore goes, a volunteer in the past took the tour several times, and was able to befriend the owner who only agreed to sell a case of the Export after much cajoling. So if you’re hearing the call of the wild beer, you may have to come visit to get a taste. A box of export lager. I have bounced on your blog to some of my teachers partly because of its ease of loading and its clarity. LOL Vailima. I can remember watching the bottles being filled.